An early morning fog rolls over the quiet streets of Arkham as its people wake and stagger out of bed. Sleepy-eyed, they begin to move, focused only on the tasks that lie before them. They don their coats and caps to ward off the autumn chill, then start upon their way to work. They pass their neighbors, greet the newspaper boy, and arrive at their desks. A distant train whistle howls, and all the while, these people remain completely unaware of the unfathomable terrors that threaten their very existence. 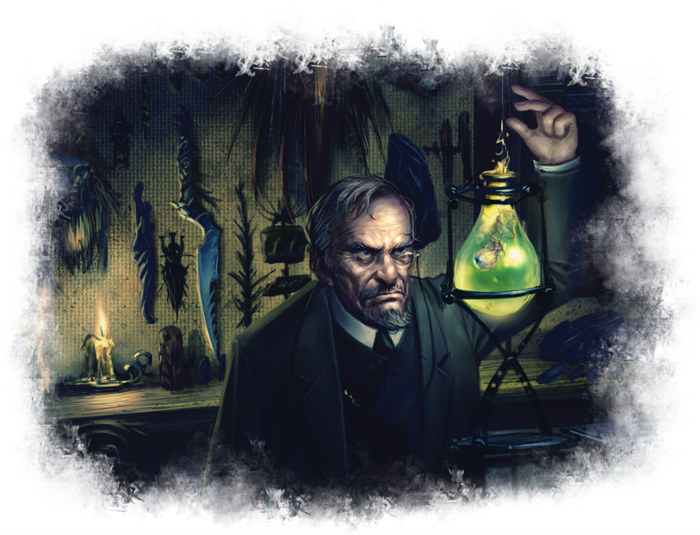 In Arkham Horror: The Card Game, powerful and malevolent beings known as Ancient Ones press against the barriers that divide their realities from our own. And while they lurk just beyond our ability to perceive them directly through our senses or science, they gnaw, nonetheless, at the minds of the psychically gifted and drive them mad. They inspire cults and cultists. They give rise to dark magic and deadly monsters. 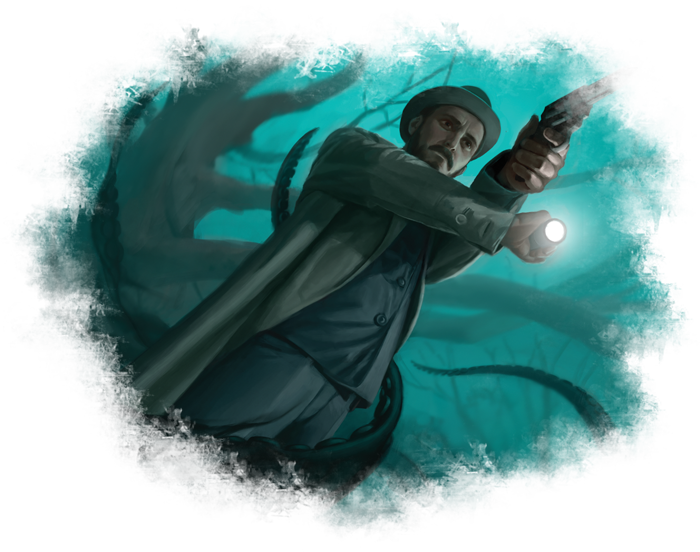 You're convinced that recent deaths and disappearances are not the work of wild animals, as the authorities suggest, and so you enter the Mythos through Arkham Horror: The Card Game as an investigator determined to uncover the truth—even if that truth may drive you mad. With its blend of traditional customizable card game and roleplay elements, Arkham Horror: The Card Game offers you an entirely new experience within the Mythos. You and up to three friends become investigators, working to solve mysteries and survive the adventures into which your investigations may lead you. And it all begins at Arkham Nights 2016. 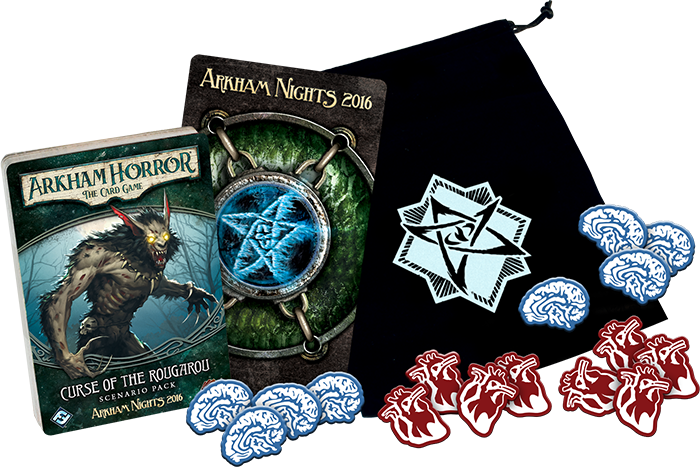 The Arkham Horror: The Card Game Core Set make its world debut at Arkham Nights, and every attendee will receive a complimentary copy of the special scenario, Curse of the Rougarou. This adventure leads your investigators deep into a tangle of nightmarish events taking place in New Orleans and the nearby bayous, and it can be played either as a standalone scenario or as one that can be woven into your ongoing campaign as a "side-story." Friday evening, the game's designers, Nate French and Matthew Newman, will take attendees deep inside the inner workings of their design. This special presentation begins at 6 PM, with time reserved for a Q&A session at its close. Later Friday evening, after the designers' presentation, and all through the weekend, you'll be able to learn more about the game and play through demonstrations. On Saturday, a handful of lucky attendees will even be able to confront the game's monsters, cultists, and madness alongside designer Matthew Newman. Finally, if you find yourself driven by an insatiable thirst for knowledge, you can ally with other investigators on Saturday and attempt to solve the mysteries of the Core Set's Night of the Zealot campaign, with or without the added challenges of Curse of the Rougarou. We'll have campaign sheets available for all interested attendees so that you can record and report your results. Who will go insane? Who will be devoured? Will anyone manage to save humanity from certain doom? We'll tabulate your results after the event and share them with the rest of the world. "…The headline was sensationalist. Three killings in nine days was enough to spook a town, sure. But you doubt all of New Orleans is gripped by terror, or even knows about the killings. Still, something piqued your interest." 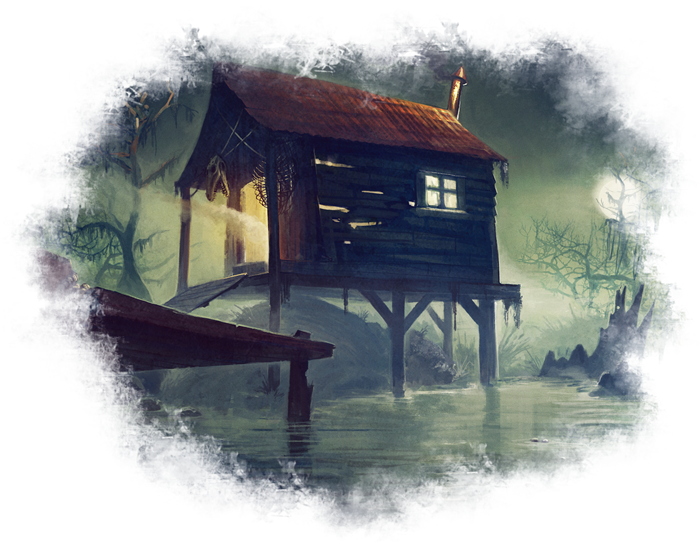 Curse of the Rougarou will be made available for purchase through FFG's in-house Factory at a later date, but for now this adventure is an exclusive opportunity for our Arkham Nights 2016 attendees. One of the highlights of any Arkham Nights event is the chance to meet and speak with the designers and developers of your favorite games. This is again the case in 2016, and Arkham Horror: The Card Game designers Nate French and Matthew Newman will be sharing their insights into the game's design, starting at 6 PM on Friday evening. 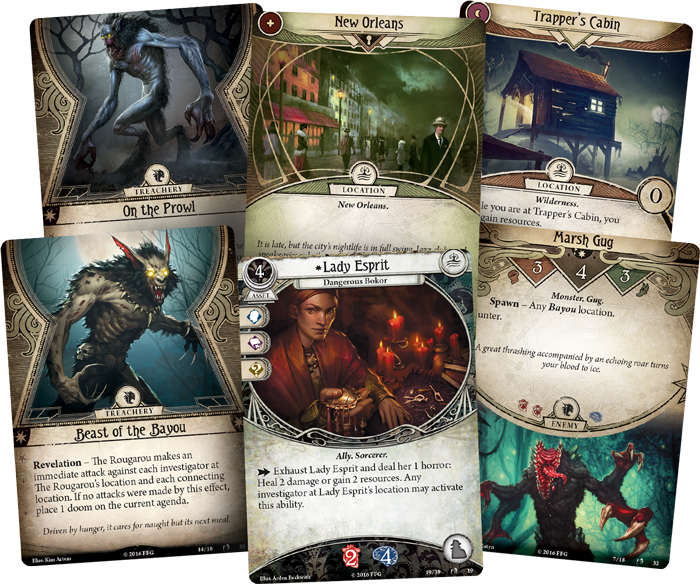 FFG: What was the inspiration for Arkham Horror: The Card Game? 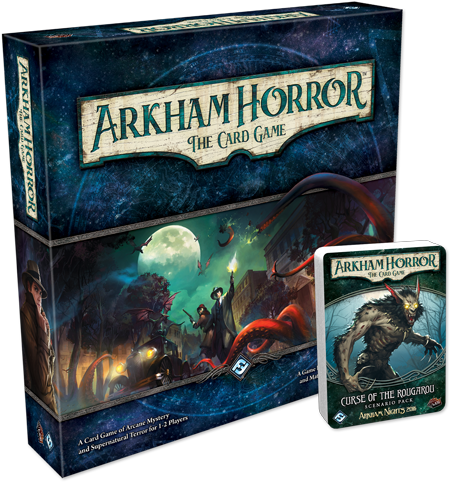 NF: "The vision behind Arkham Horror: The Card Game is that of an LCG® that is inspired by and captures elements of the RPG experience. We began with a simple idea: your deck is your character. From this starting point, a number of exciting possibilities arose: campaign play in which early decisions impact future scenarios, decks that 'level up' as an investigator gains experience (along with new cards that may be acquired through play), flaws and weaknesses that help define an investigator and also inform the way the investigator is played, free-form turns in which a vast array of possible action decisions are available to an investigator, and strong cooperative elements." FFG: The game can be played in standalone adventures, but you recommend campaign play as the preferred format. What do you like about this format? FFG: Sounds fun. Do you have any fond memories from playtesting you’d like to share? FFG: That detective always seems to show up at the wrong time, and he always leads to new tensions. Of course, he's not the only source of tension. We've discovered there are quite a few tense moments in this game. Do you have any favorites, Matt? MN: “Many of my favorite moments come from the chaos tokens and the way they affect players psychologically. Investigators have many ways of balancing the scale in their favor, but the chance of catastrophic failure always looms. Drawing the coveted elder sign token when an investigator attempts a seemingly impossible task often leads to actual shouts of joy. But the reverse is also true, and the chaos bag sometimes leads to great storytelling moments where a simple task turns surprisingly dire—just like in the best horror stories!" The Arkham Nights 2016 gift bag is only available to those players who have preregistered! The boundaries between worlds have grown perilously thin, and a gate has opened. Arkham Nights 2016 takes place in Roseville, MN this October 14-15 and marks the debut of Arkham Horror: The Card Game as part of a whole weekend of Lovecraftian horror. UPDATE: These otherworldly gates never stay open for long, and this gate has now closed. Arkham Nights 2016 has sold out. We look forward to meeting all those daring souls who stepped through the gate to join us, and we encourage those of you still on the other side to come join us in the Mythos when Arkham Horror: The Card Game arrives at retailers. Be sure to pre-order your copy today! Arkham Nights 2016 is an exclusive weekend of Lovecraftian horror on October 14-15 at the Fantasy Flight Games Center! You and your friends can enjoy demos, play games with the designers, and pick up early copies of Arkham Horror: The Card Game.